• Available in Beige color Grain Leather. • Drill textile back, rubberized cuff. - Used for safety purpose. - Split leather with cotton drill back, rubberized cuff canadian gloves. - 5 fingure lining inside. - Various model & size. We are leading manufacturers of Canadian Colored Grain Leather Gloves to our client. We are offering huge variety of Canadian Putch Pump Gloves. Our offered Gloves are designed by our vendors using optimum quality raw material and contemporary technology. 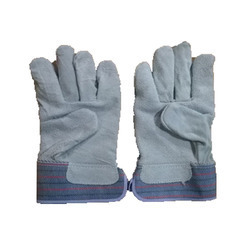 These hand gloves are strictly tested on various parameters of quality. Also, we provide these hand gloves at most reasonable prices. We are a reputed organization in the domain, engaged in offering Canadian Range Leather Gloves. These gloves are designed and crafted as per the latest market trends using high grade basic materials under the guidance of proficient professionals. We have in store for our customers a wide range of Leather Canadian Gloves. 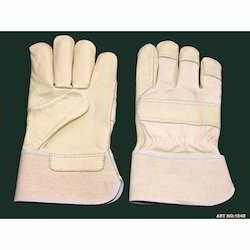 These gloves are made of quality leather and are widely appreciated for neat stitching and tear resistant finish. Further, these are offered with rubber cuff which makes it suitable for various industrial purposes such as components assembly, automotive and other jobs in oily and wet conditions. 3 tips split leather Canadian, small pulse protection white cotton drill back & rubb. 7.5 cm cuff, inside cotton lining , thickness 1.0 mm. We are supplying canadian leather gloves.